Hanging off the deck of a Mercy Ship. All photos courtesy of Mercy Ships. What could be cooler than a giant civilian hospital that provides medical care to the developing nations of West Africa? A floating one. Mercy Ships owns and operates the world's largest civilian hospital ship, Africa Mercy, staffed by 400 volunteers from 40 nations. Erin Horn is a 28-year-old medical-surgical ward nurse born and raised in South Carolina. She joined the U.S. Air Force Nurse Corp after graduating from USC Upstate. Four years later she left for a voyage with Mercy Ships, volunteering on The Africa Mercy for the past two years, fifteen months total, serving in Cornakry, Guinea, and Pointe Noire, Republic of Congo. Here's her story. How did you learn about Mercy Ships? 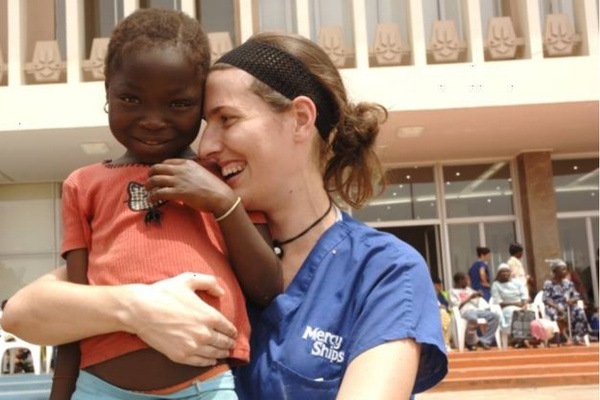 I first learned about Mercy Ships when I was a nursing student at USC Upstate in Spartanburg, South Carolina. I had always known I wanted to explore medical mission opportunities and came across their website. I liked their values and their mission statement. Had you had any prior experience with medicine in developing countries? No, not really. The only experience I had in nursing outside of the U.S. was during my deployment to Afghanistan as a nurse for the U.S. Air Force. I wasn't allowed off the military base and mostly took care of American and coalition forces. 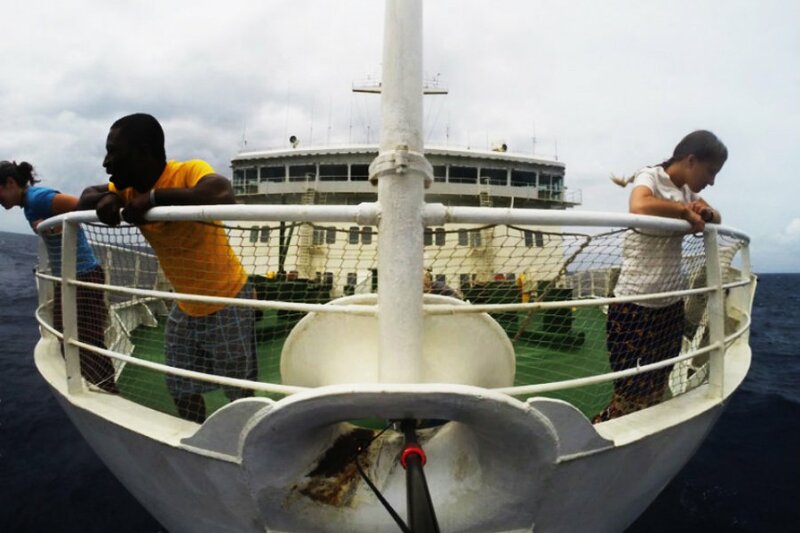 What was a typical day like on The Africa Mercy? Full. A day on the ship is full of people, interactions, conversations, love, and care. I typically work eight hour shifts on the maxillofacial ward and rotate days, evenings, or nights. Erin treats a patient on the ship. Our goal is to care for the poorest of the poor in developing African countries. But sometimes, I think the volunteers benefit more than those we serve. We provide Africans with free medical care, but we receive so much love and joy in return. What was the best part and the most challenging part of the voyage? The best part is seeing the transformation in lives. Patients who come onboard the ship have often been outcast and treated as less than human by their communities and families — they're considered "cursed" by their illnesses. We look them in the eye, tell them we care about them, and treat their ailments. They slowly come out of their shells and transform before our eyes. It's a miracle I never tire of. The worst part is seeing first-hand the extremes of poverty and suffering. As a nurse, I naturally want to fix all the problems I see. It's a helpless and overwhelming feeling to realize I can't. It's especially hard to realize the sheer randomness of my fortune compared to these people. If I had been born in a developing African country instead of the U.S., I could be the fourteen-year-old girl with the obstetric fistula, constantly leaking urine. I could be the twelve-year-old boy whose face is scarred from Noma. I could be the mother with a cleft-lip baby. Tell us about a favorite moment. One night I was stopped by an impromptu dance party on the way to my night shift. Patients, doctors, nurses, and translators were standing in a circle getting down in the middle of the hallway. As I attempted to walk past, a young girl who initially was too shy to talk starting shouting my name: "Erin! Dance! Erin, dance! Dance, fotay, dance!" (“Dance, white person, dance!”) How could I say no to that? I jumped in the circle and showed off my poor dance skills to much laughter and shouting. When someone else tried to sneak past, I joined in with the rest of the circle shouting "Dance, fotay, dance!" This is a small glimpse of the joy and laughter that fill our days on the ship. 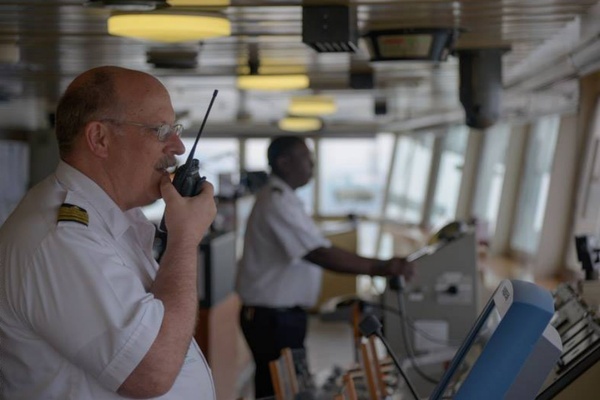 Who should volunteer with Mercy Ships? Can people without medical degrees volunteer? Everyone can volunteer! You don't have to have a medical degree. The ship needs all kinds of volunteers — from cooks, to kitchen staff, to housekeeping, to carpenters, and handymen (electricians, engineers, plumbers, etc.) who fix what gets broken, to all the marine operations personnel who keep the ship running. We also need accounting and finance personnel, chaplains, human resources professionals, and schoolteachers who teach at the kindergarden level through the twelfth grade accredited school academy onboard the ship. The list is seemingly endless! What advice would you give to someone who wanted to volunteer with Mercy Ships? Depending on the position you apply for, you can volunteer as short-term crew or long-term crew. I would advise coming for at least three months to get a feel for life on the ship. Absolutely! I have already applied to rejoin the ship as volunteer crew next year. There's a whole lot of love to give. Has this experience changed the way you think about medicine? About travel? Working in developing countries makes you appreciate people for who they are as humans, not based on their circumstances or their socio-economic status. I'm way more appreciative of the healthcare available in the United States. We can't imagine what it's like to have diseases ravaging our country like they do in Africa. I love to travel and see new places, but after working with Mercy Ships, travel is not so much about me anymore, or the beautiful places I get to see. It’s more about people I meet and the relationships I form. I have friends and people that I know, love, and care about in developing countries. Now when I hear about something happening on the news in West Africa, I wonder if someone I care about has been affected personally. It used to just be world news to me. 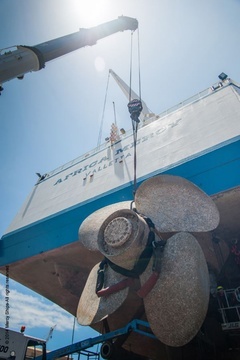 Africa Mercy is the world's largest charity hospital ship, equipped with five state-of-the-art operating rooms and an intensive care unit for 82 patients. The ship performs about seven thousand surgeries per year, including cataract and tumor removals, cleft lip and palate reconstruction, orthopaedics surgery, and obstetric fistula repair. Ship-based teams also provide services to local villages — dental and medical clinics, community health education, HIV/AIDS intervention, and water and sanitation projcets. Africa Mercy runs with a crew of about 450 people who range in volunteer service. See the unique ways you can help onboard the ship here. 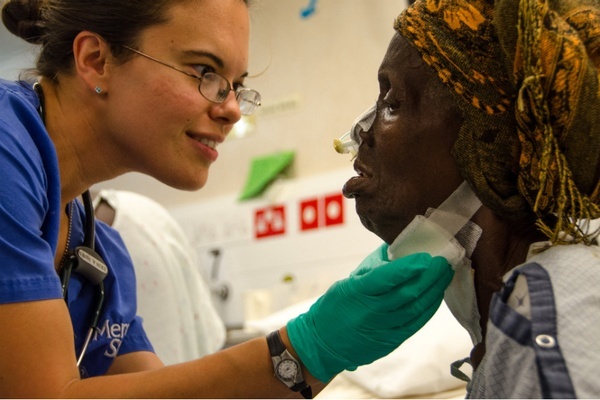 Erin Horn is volunteer surgical ward nurse on Mercy Ships. She travels for the adventure of meeting new people, experiencing different cultures, and seeing more of this beautiful world.